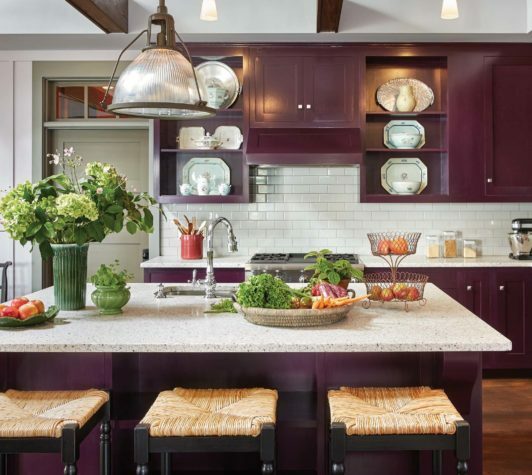 In the kitchen, vintage turned chairs with rush seats pull up to a center island topped with Vermont High Ridge Granite. Overhead is a new vintage-style Holophane light fixture from the Brass Light Gallery. The cabinets, which were crafted locally, are hand painted in Farrow and Ball’s Pelt Shade. A circa-1910 American arts and crafts oak desk provides work space in the office, and an articulated oak armchair with wide drop-leaf arms (also American, circa 1910) offers a spot to relax and read. 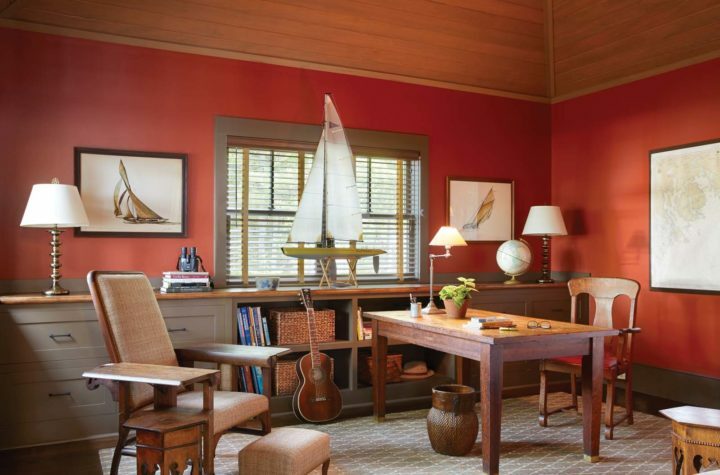 Sailing memorabilia, including a framed chart, serve to reinforce the house’s seaside location. The stairway features an arts and crafts table from circa 1910 and an American tabouret from approximately 1900. The print is from the 90-year-old artist Dan Miller who works in Corea, Maine. 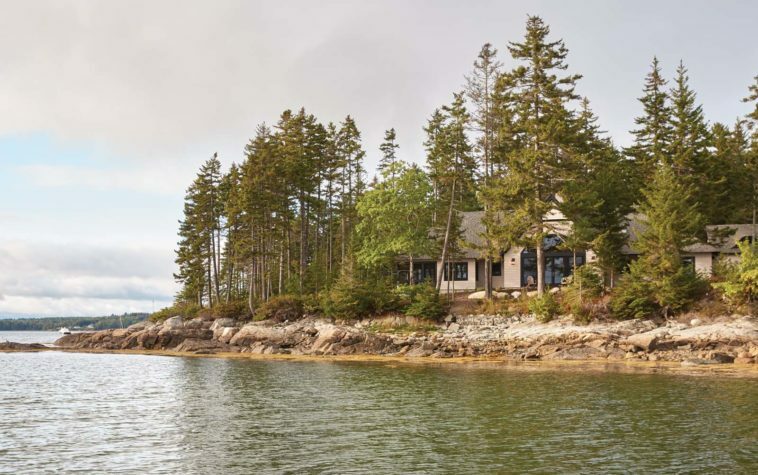 The design of the house connects it both to its setting and to the coastal traditions of downeast architecture. Augusto and Kay Stevens Rosa of Bar Harbor’s A4 Architects sought a close connection to nature but also left their own aesthetic imprint in such details as the large arched window looking out onto the water. In the owners’ suite, the four-poster bed was sourced from Room and Board, and the modern Gustavian chests are from Wisteria. While much of the furniture in the house was already in the family, the farm table was custom made for the dining room; the chairs are Yorkshire spindle-backs with rush seats from the late-eighteenth or early-ninetheeth century. 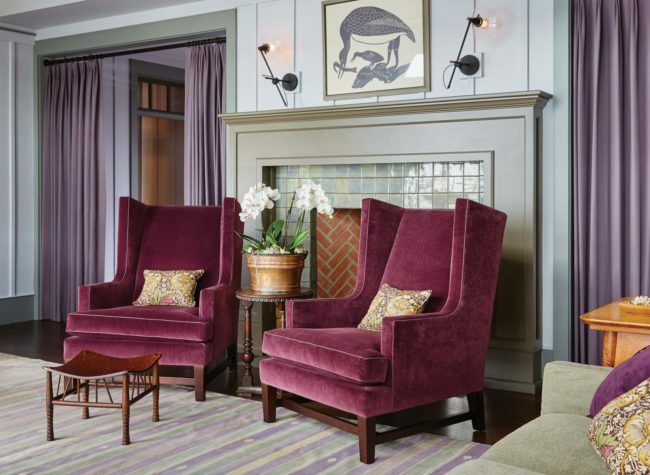 A pair of wing chairs from Lee Industries is upholstered in cotton velvet and accented with pillows covered in Morris and Company’s “Kennet” fabric. A view into the living room from the terrace shows the large-scale faux antler chandelier (from CDN Antler Designs) that hangs over an American Empire oak table. 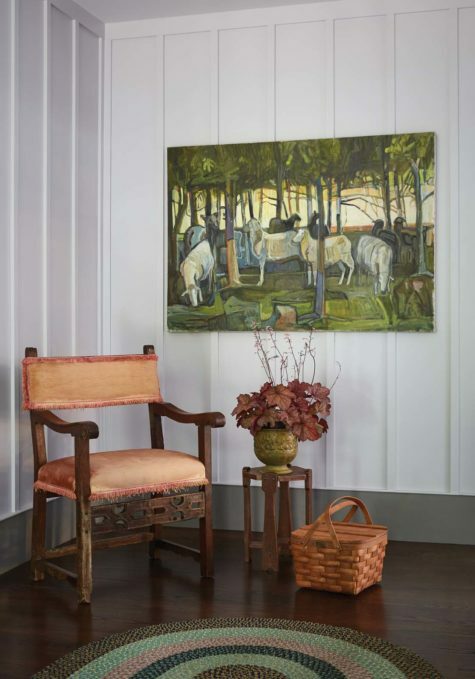 A midcentury painting by Maine artist Charles Olson hangs above the rag rug that inspired much of the interior color scheme for the house. The chair is from seventeeth-century Spain. The bedroom features a window seat as well as an antique hooked rug. The Queen Anne painted tea table was bought at the Massachusetts-based Skinner. The Lollipop chair by George Hunzinger is from the late-nineteeth century. It is a quiet retreat for two but near enough to extended family to be a gathering place for many. It is, as the owners spelled out, a house that is comparatively small but, as Gissler puts it, “lives spaciously.” Gissler, who is based in New York, had worked with the homeowners before; their home base is Boulder, Colorado, but they have a pied-a-terre in Manhattan that he designed. 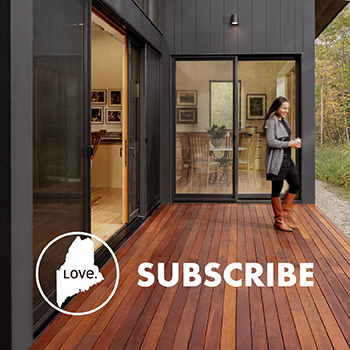 The architects—Kay Stevens Rosa and Augusto Rosa of Bar Harbor’s A4 Architects—had not previously worked with the couple but found that their goals and ideas for making the house were perfectly aligned. First there was the site. The house sits on a spit of land with 270 degrees of shoreline, part of a larger camp that had been in the extended family for some decades, all in a particularly picturesque part of the state. Settled in 1762 and incorporated in 1895, the tiny town of Sorrento is often considered to be one of Maine’s most photogenic spots. Those sightlines were a prime goal in the architecture. “The desire was to maintain the natural landscape, trees, and ledge outcroppings and to use the interstitial views to arrange interior spaces,” recalls Kay. 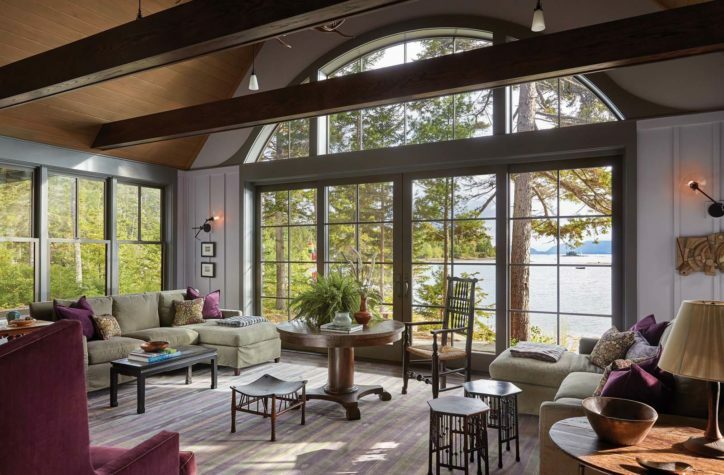 In the living room, large doors and windows maximize the view of Mount Desert Island; the office looks out to the northwest, where the owners’ boat (a 38-foot Downeast cruiser) is moored. The eat-in kitchen and adjoining screened porch gaze toward Hancock Point, and the owners’ suite—which gets bathed in the morning sun—has what Kay terms “a serene cove view.” Water, water, everywhere. To clad the 3,500-square-foot house, the Rosas selected bleached white cedar shingles that will eventu- ally turn silver, as well as ebony-stained trim. The cladding and the organically laid stone patio are a clear nod to the historic vernacular architecture of the region, though simplified and modernized. “We feel it is important for a structure to be true to its own time as well as its context and history,” says Kay. 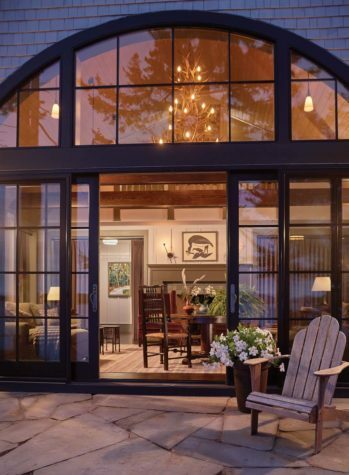 Among the hallmarks of A4 Architects’ style are variations in scale, including varied ceiling heights, and the use of curves to accentuate the most important spaces—in this case, the entry porch and the living room. The first floor of the house has a grandly proportioned double-height living room with vaulted ceilings and a tile-clad fireplace. Other rooms include an owners’ bedroom suite, “his and hers” office spaces, and a kitchen—spaces that Kay describes as “gracious yet informal.” A butler’s pantry–inspired bar connects the kitchen and living room, the latter possessing a cozy corner library and TV nook for two. There’s also a multipurpose mud/laundry/gear room, a powder room, and a screened porch. The architects added a loft overlooking the living rooms. It is home to an art studio, an exercise space, and a play area for visiting grandchildren. Although it is, functionally speaking, a one-bedroom house, Kay points out that several rooms, including the art studio and one office, can be used as guest bedrooms as well. 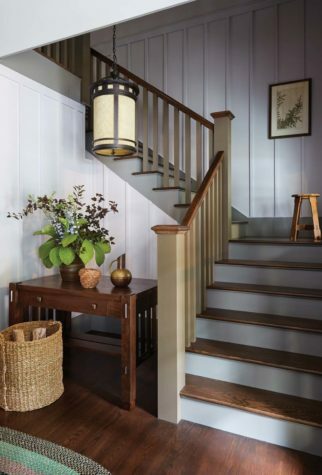 The sense of context inherent in the architecture is carried from the outside in, with random-length oak floors throughout and painted board-and-batten walls. Gissler drew his inspiration for the palette of the upholstery, paint, and window treatments from the hues of the landscape and from an existing rug with soft green and lavender stripes. To that end, one of his first purchases was a small one that set the tone: a grape- and gold-hued William Morris textile (the pattern is Kennet) that is used on accent pillows both on the sectional sofa and the twin velvet wing chairs. Much of the furniture is American arts and crafts style, or at least from that period just after the turn of the twentieth century. Some of it, says Gissler, came from the original family house on the property, a large Victorian cottage. 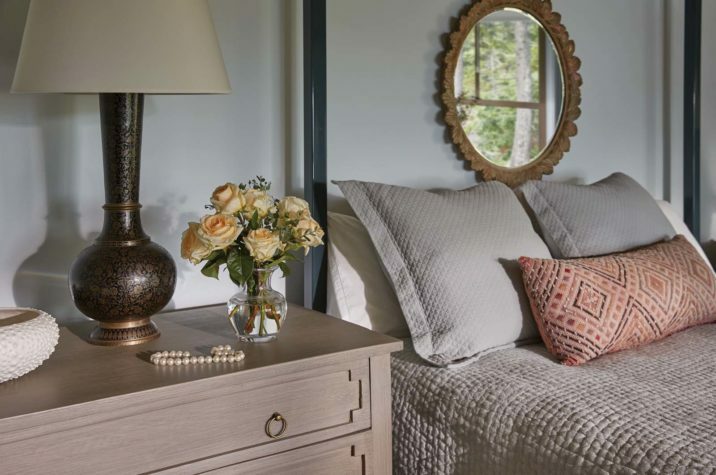 Other pieces are new, among them the living room sectional sofas and wing chairs, which came from the North Carolina–based Lee Industries, and the modern Gustavian chests in the bedroom, which Gissler sourced from the Texas furniture company Wisteria. “The furnishings and decorations have a solid confidence one might associate with homes at the turn of the twentieth century,” he says. 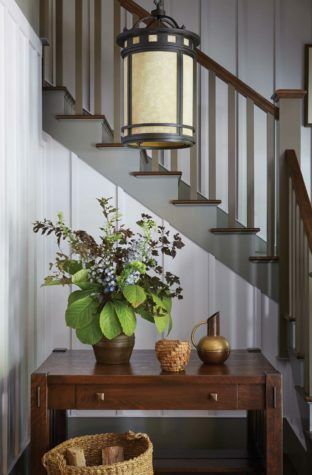 The floor coverings—including rag, cotton hooked, and sisal rugs—all have what Gissler calls “a summer ease.” To provide a sense of continuity between past and present, Gissler opted for a variety of vintage- styled light fixtures throughout the house. “In places where others might have resorted to recessed lights, we used pendant lights that provide a more pleasing kind of illumination. In some fixtures we used vintage clear Edison light bulbs,” he says. 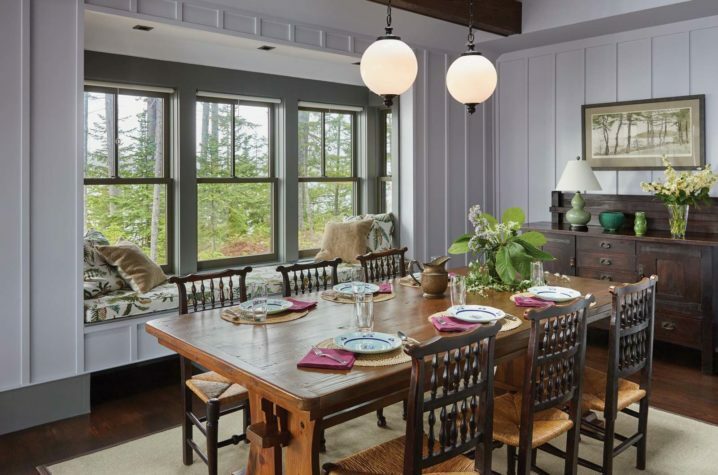 “Absolutely everything is on dimmers to allow for ‘ambiance control.’” A large- scale faux antler chandelier (from CDN Antler Designs) hangs in the living room; other light fixtures come from Rejuvenation and Schoolhouse. Although the new furniture and fixtures reflect the aesthetic spirit of the house, they are very much of their time. “We don’t do fake antiques,” says Gissler. For the interior designer and architects, the melding of old and new, time and place, formal and casual was the key to finding the perfect balance. It’s a combination of style, substance, and serendipity, along with what Gissler likes to call alchemy—a formula that creates an enchanting home.